If you are looking for ways to help your dog love his crate, try playing crate games with him. Crate games are a fantastic way to teach your dog to run in and out of the crate on command willingly, and they are fun to play for both of you. Using games with the crate is especially helpful since many dogs aren’t initially happy with being confined. By moving slowly through these fun processes, your dog will learn to love his crate. In this article, I’ve put together six great crate games to play with your dog. Although wire crates are great for a growing puppy, it’s easier to train these games with a hard plastic airline crate or soft crate. Throwing treats into a wire crate sometimes results in them flying through the bars, so if you use a wire crate, be careful how you throw them. 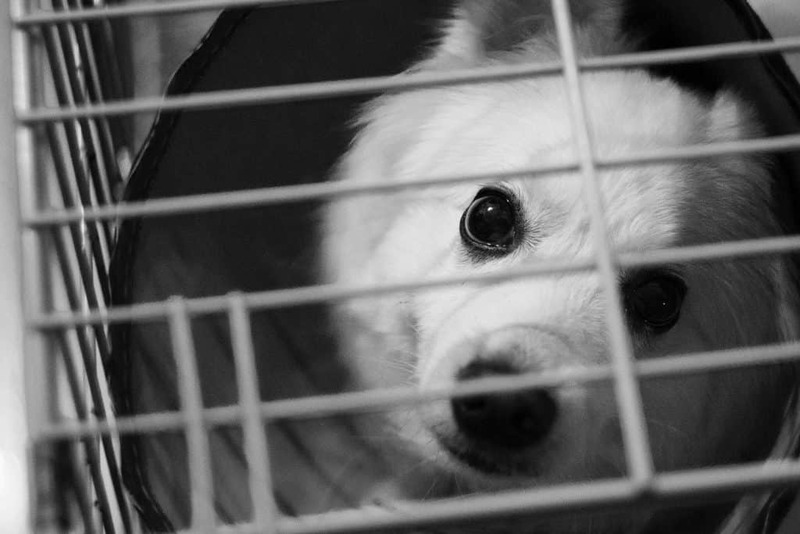 It’s a good idea to have started feeding your dog his meals inside the crate, so he’s already begun to expect that going inside means something good is about to happen. And be sure you’ve taken your dog out to potty before playing crate training games with him. Keep your training sessions short and fun. Use a release word like “Okay!” or “Release” or “Free” to let your dog know he’s done and can come out. Be sure to put a little energy into saying it, and move to help him see that you want him to come out of the crate. Always train when you are in a good mood. If you’re not feeling happy, your dog will sense it, and it will affect the training session. A couple of short sessions a day is plenty. Don’t turn it into a grind. You should play each game for several days before moving to the next – the concepts build on each other, and later games rely on the skills learned in the earlier ones. If your dog doesn’t go inside, even for yummy treats, see our article on crate training an older dog for some ideas to help get started. With the crate door open, sprinkle some treats outside the door as well as just inside the crate. Let him eat the treats, and toss a couple more all the way to the back of the crate. Does he go all the way inside and get them? If so, you’re ready to move on to Game 2. If he doesn’t go all the way in, play this game a few times each day until he warms up to his crate. Be sure not to close the door at this stage – you don’t want him to worry about being trapped! Once he’s happily going in and out of his crate, it’s time to move on to the next game. Now you want to start building a hand signal for going into the crate. Practice swinging your hand with your finger pointed while at the same time throwing a treat with that hand. It might feel awkward at first, but with a little practice, it will become natural. The motion should look like you’re telling your dog to go where you’re pointing. Once you’ve got the motion down, stand beside the open crate door and toss a treat far inside the crate using your hand motion. At this point he should follow the treat – if not, go back to Game 1. If he did follow the treat into the crate, toss another far inside for him. Keep throwing in treats as he eats, until you see him wait for another treat rather than trying to leave his crate. Then add a “Okay!” word in a happy voice, and encourage him to come out. This will begin the process of teaching him to wait until you let him out, instead of him trying to bolt out of the crate as you open the door. Be happy and excited that he’s doing well, and remember not to close the door during this game. Now let’s add a command word to the process. Stand by the open crate just like Game 2, only this time say a cue like “Kennel Up!” or “Crate!” just before you point and throw the treat. Be sure to say the word before you move, so that your pup can realize that the word means you are about to make the motion he already understands, and eventually will go in just with the word. This time when he goes into the crate, dump several treats into the crate behind him while he’s eating the first treat. Do this a couple of times to reinforce how great it is to stay inside, and then use a “Okay!” word (“Release” or other word you’ve chosen) in a happy voice, and encourage him to come out. This will begin the process of teaching him to wait for permission to exit. Practice this a few more times, and then test to see if he’s getting the connection between the word and the action of going into the crate. To test his understanding, stand the way you did before and say your command, but this time don’t move. If he runs into the crate, act happy and drop a handful of treats into the crate with him. Add a few more treats when he finishes those, and then release him as you did earlier. If your dog understands, be sure to repeat the game a few more times to help it stick in his memory. If he doesn’t run inside, go back to using the hand signal after you say the word a few more times before trying again without the hand motion. And keep the door open at all times for this game. Even if he “gets” it, the next time you play this game he might forget at first. If that happens, just try a few times with the signal again before trying again without it. Now that he’s going in on cue, we want to start working on coming out with permission. Using your verbal command (“Kennel up!” or “Crate!”), send your dog into the crate, just like you did for Game 3. Give him a couple of treats for going in, and then stand back up and wait to see what he’s going to do. If he waits expectantly for more treats, toss another treat inside and wait again. If he runs out of the crate instead, go back to Game 3 and keep playing until he seems like he’s expecting more treats after he goes in. After he’s waited for treats a few times (for just a few seconds), then release him with a happy “Okay!” and let him know what a good dog he is. Be sure to practice this a few times a day for a couple of days before moving on. Now we’re upping the ante by closing the crate door while your dog is inside. Take it slowly at first, and keep it fun! Use your command to send your pup into his crate, and give him some treats. While he’s eating, close the door. As he finishes up, open the door and say “Okay!” to let him out. Gradually increase the time you keep the door closed. As you extend the time, let’s say over 10 seconds, hand him a treat through the closed door to reward him for his patience. Don’t give him a treat or open the door if he is fussing. If he’s barking or whining or pawing at the door, ignore him and wait for a break in that behavior to release him. If this break happens, don’t take so long to reward him and let him out next time. Keep playing this game until he can stay calmly in his crate for at least 30 seconds while you stand nearby. Then you can start mixing it up by moving away from the crate and back, testing if he’s quiet or not. If not, next time make it easier again. Now it’s time to teach him to respect the threshold of the crate, and not come out until you give him permission. If you’ve been playing the earlier games, this should be easy for him, since you’ve been teaching him your release word all along. Follow the procedure in Game 5, but now we will require your dog to either sit or lie down inside the crate before being let out. To do this, we are going to use a bit of a back-and-forth process to show him what you mean. This works best if you don’t say anything, but just let your pup figure out what to do by what happens. Wait for him to sit or lie down, and then move your hand to the latch. If he gets up, take your hand off the latch and stand back up. Wait for him to sit (or lie down). When he sits, touch the latch again. If he doesn’t get up, give him a treat through the bars to let him know that was the right decision. If he gets up, just repeat the process. After he stays in position when you touch the latch, then start to open the door. Again, if he gets up, just close the latch and stand back up. Repeat the above process. Eventually, he will understand that you want him to stay seated, and you can get the door open a little bit while he’s still in position. At this point, swing the door open and release him right away, with happiness all around. You both did a great job! Practice this game until you can get the door all the way open and he doesn’t move unless you release him. This could take a week or more, so be patient and remember to proceed slowly through the steps. If he starts to move at any point before being released, you should quickly close the door – if necessary, firmly push him back inside. Crate training games are a fun and easy way to teach manners, and they help your dog learn that the crate is a rewarding and comfortable place to be. By taking the time to teach your dog using these games, you avoid the problems created by using the crate for punishment. 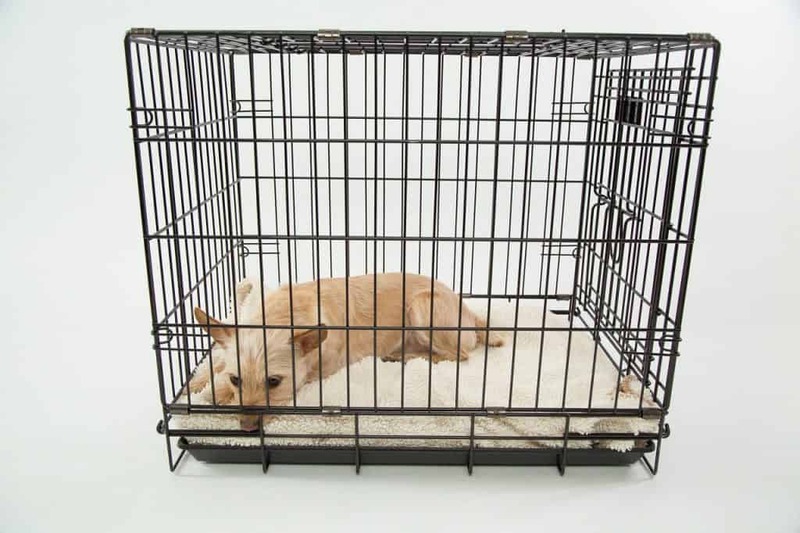 When your dog loves his crate, he will find it less stressful if situations arise that require it, even after he has earned his freedom in your home. 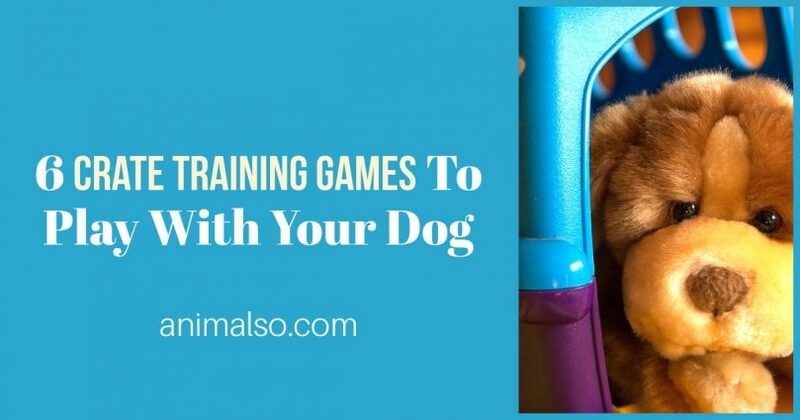 Take the time to play these games now, and both you and your dog will be glad you did!